Riders are rising to new heights! Ricky with Donna – its official! 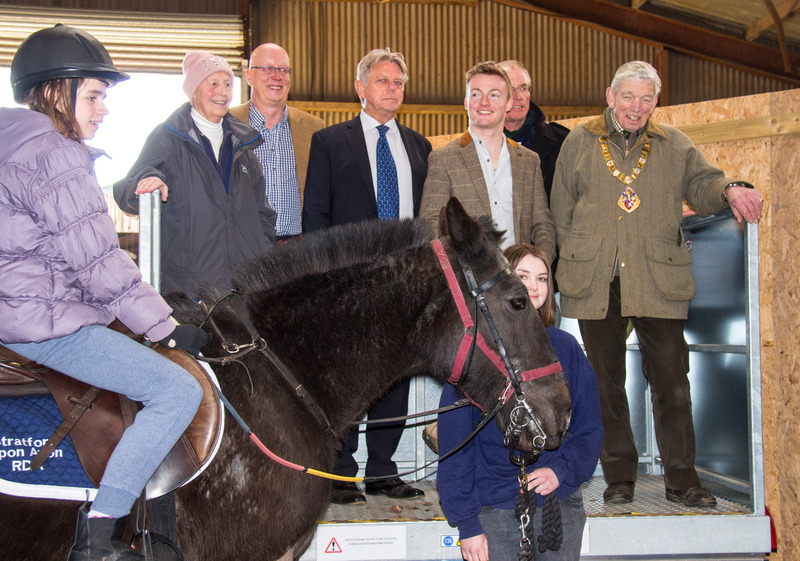 The Group celebrated in style yesterday, 31st March, when we launched the installation of our new hydraulic lift which will enable our riders to mount their horses in a more efficient manner. Described as the ‘flying carpet’ by our Group Instructor, Karen Arnold, the lift was officially ‘opened’ by Paralympic Equestrian Dressage rider Ricky Balshaw who commenced his successful riding career with RDA at the age of 4, was spotted and joined Team GB at the age of 16. Harrison, Sophia, Holly and Arthur, our child riders, gave a lovely demonstration of their riding skills, instructed by Puffin, to a packed audience of their parents, carers, RDA volunteers and financial supporters to a tune from Frozen. Two further riders Matthew and Charlotte, also gave a demonstration of how they mount from the lift so that everyone could see the ‘flying carpet’ in action. Ricky was kept busy cutting the ribbon, our celebration cake and unveiling the plaque and proved to be a fantastic ambassador for RDA. This lift represents a significant investment for our group. The ponies have taken to it with ease and it has already proved to be a positive experience for our riders, especially those with reduced mobility, as it is big enough to take a wheelchair. We have a lot of people to thank for their kind support and generosity, but primarily we are indebted to the owners of Home Farm and Dan Wain Equestrian, who operates the stable facility, for allowing us to install it alongside the arena. The lift which cost upwards of £15,000 to install has been funded through the kind generosity of a variety of sources including Mrs Linda Morris, Mark & Vanessa Petterson, the supporters of a Garden Concert given by the A440 Chamber Orchestra last year in Adderbury and the fundraising efforts of the Stratford on Avon District Council past Chair, Councillor Chris Mills and this year’s Chair, Councillor Simon Jackson as part of their year in office. Next post: Stratford Rotary sponsor for another year!